Preheat a grill pan. Lightly brush both sides of the bread with olive oil. Grill the bread over high heat, turning once, until lightly charred and crisp, about 30 seconds per side. Transfer to plates. In a large skillet, heat the 3 tablespoons of olive oil. Add the mushrooms, season with salt and pepper and cook over moderately high heat, stirring occasionally, until softened and browned, about 5 minutes. Add the garlic and cook, stirring, until fragrant, about 2 minutes. 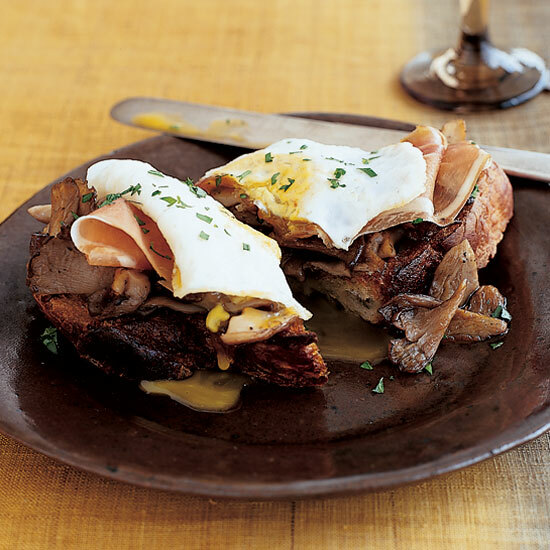 Using a slotted spoon, spread the mushrooms on the toast. Add the Serrano ham to the skillet and cook over moderately high heat until warmed through and slightly crisp, about 5 seconds per side. Set the ham over the mushrooms. Crack the eggs into the skillet and fry them over easy. Top each toast with an egg, sprinkle with the parsley and serve at once. The smokiness of the grilled bread and the earthiness of the mushrooms point to a refreshing but assertive dry Spanish roséwith depth and good structure.